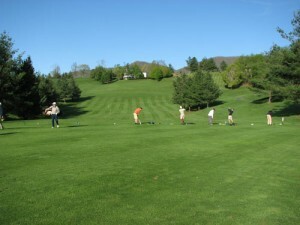 Mountain Aire Golf Club offers exceptional practice facilities that will allow golfers to warm up before their round or sharpen their skills throughout the season. We offer a full distance driving range as well as a practice green with a sand bunker to help you build confidence in every area of your game. These facilities are open during our regular golf course hours of operation. Mountain Aire also has a 2-hole junior course that can be used to teach your future golfers the game of golf at no cost to you. These holes are available to young people ages 17 & under during regular business hours. Children should be supervised by an adult at all times. We encourage you to bring your young family members out and show them how much fun they can have playing golf. If you or someone you know is interested, please contact the pro shop at 336-877-4716 for information about the junior course.